Reservations are not needed unless otherwise noted for special programs. General admission is still only $5 per person (kids 5 and under are free) and 100% of the fee (along with donations & proceeds from gift shop sales) goes right back into care and food for the animals! Our staff is completely all volunteer, so no money is used to pay staff. Special programs such as photography sessions and camp programs cost extra. Please remember, we cannot accept debit or credit cards, so be sure to stop at your ATM first to bring necessary cash for admission and gift shop purchases. Is there parking for a large camper or bus? Yes! We literally have acres of available free parking for vehicles of all sizes. Our driveway is packed gravel and is steep, but we have campers, trucks, school buses, coach buses, and cars of all types navigate easily. Please follow posted speed limits and use caution. Motorcycles are permitted, but be aware there may be loose gravel and ruts on the driveway. Are there special tour times? Docent guided tours leave our Welcome Cabin area at 12:30 and 2:00 pm on Sundays. Additional tour times during the months of July and August include 12:30 pm on Fridays and Saturdays. These educational tours last approximately one hour, include visits at each animal enclosure, and are included with your $5 entry fee. Due to the slower pace, these tours might not be suitable for younger children with bundles of energy. Prefer to wander at your own pace? Visitors can ask for a map at the admissions cabin. The map shows the various stations/stops along the self guided trail with informational kiosks located throughout the center. Staff are located at each station to answer questions and to provide additional information. We are a sanctuary and encourage visitors to stop and enjoy the animals and the pastoral environment. Visitors are encouraged to take their time and enjoy the peaceful surroundings while watching the animals. We have 24 animals located in 12 various enclosures spread throughout the 64+ acres encompassing the center. Benches are located near animal exhibits for resting and quiet observation. Depending on staff availability, guided ecology forest hikes and various animal enrichment programs occur (these are spontaneous programs and have no preset times--upon arrival staff will notify visitors what program(s) will be occurring at what times on any specific day). For most of the year our tipi village is set up for exploring. The center operates 100% on solar power--staff are more than happy to discuss how its works. We also have a picnic area with hibachi grills for use (we do not sell concessions), a gift shop, and a hands-on classroom (which is heated during cooler temperatures). Anytime! Our animals have all been raised by humans from puppy-hood, so they are very accustomed to human presence and typically are very close to fences to check out the two legged visitors. Our wolves and Arctic Foxes are Alaskan/Arctic animals so they thrive in colder temperatures and tend to be much more active during cooler evenings and winter months! Of course they are still visible in warmer months, but may exhibit a more laid back behavior. Our number one priority is the comfort of the animals, therefore we never force them to "expose" themselves to the public if the animal chooses to relax in the tall grass/woods out of sight. Rest assured though--you will definitely see wolves, foxes, and coyotes! When do you feed the wolves? Our wolves eat three or four times a week; usually when temperatures are cooler so they can process the food better (remember, these are Alaskan/Arctic animals who thrive in the cold!). As with all enrichment programs, we will announce to visitors upon arrival if a feeding program will be occurring during your visit. Can we touch/pet the wolves? Can we go in with the wolves? No! No! No! New York State regulations prohibit visitors from having physical contact with pure wolves! ONLY our trained, experienced animals caretakers are permitted to enter enclosures and have physical contact with the animals. Typically our caretakers have spent hundreds of hours at the center learning, observing, and discussing wolf behaviors prior to becoming certified to work in direct contact with any of our animals. Although the wolves have been exposed to human contact since puppy-hood, they accept a select few individuals as a part of their "pack", thus allowing these humans to enter wolf territory. Our wolves may appear to be "tame", but they are still wild animals and as such, retain many of their wild behaviors. Having total strangers enter their space can be very traumatic--imagine having strangers enter your home uninvited and hugging you and your kids! Can we take photographs and videos of the animals? Absolutely! Our animals are as close to you as only four feet away so its easy to get pictures of them. For those who wish to take photos without fencing between the animal and the camera, consider registering for one of our special photography sessions. See our special events listing for dates, times, and registration fees for these programs. How much walking is involved? How much time will I spend at the center? All of the animal exhibits can be viewed by walking an approximately 3/4 mile loop. Benches are located throughout the route to stop, rest, observe, and enjoy. Since visitors walk at their own pace, visits vary greatly in length. The average time spent here (without stopping for a picnic) is about two hours. Our trails and walkways are not paved, but are grassy and not perfectly smooth surfaces. However, we frequently have visitors who navigate easily in wheelchairs, scooters, and strollers. We have a restroom and gift shop entrance with a ramp for added accessibility for those with physical challenges. Are service animals permitted? Are pets permitted? Unfortunately we cannot allow pets and other animals on center grounds. Wolves are extremely territorial animals and become very agitated when they sense other animals , especially canines, in their territory. Even if your pet is left in your vehicle, our wolves will see, smell, or hear your pet and become frustrated, thus causing stress. At the Center, we do everything possible to alleviate undue stress in our animals, so please leave your pets/service animals at home. Should you need aid in navigating the center, one of our volunteers will gladly provide assistance. No! We are a smoke-free (this includes all types of cigars, cigarettes, pipes, e-smokers, etc.) and an alcohol-free environment. From Syracuse/Cazenovia: Rt 481 south to Rt 5/92 heading towards Manlius/Cazenovia. In Cazenovia, turn left onto Rt 20 east. Go about 3/4 mile, then turn right onto Rt 13 heading towards New Woodstock. Go about 7 miles-- as you approach New Woodstock, the road will come to a "T"; turn left and continue following Rt 13. After approximately 4 miles, Rt 13 veers off to the right, but you should follow Rt 80 east. Continue on this road about 7 miles until the road again "T"s at Georgetown. Turn right onto Rt 26/80. After about 5 miles, turn left onto County Route 16. Follow this for about 10 miles. After a large red barn on your right, turn left onto Hopkins Crandall Road. Our driveway is 2.2 miles on the right. 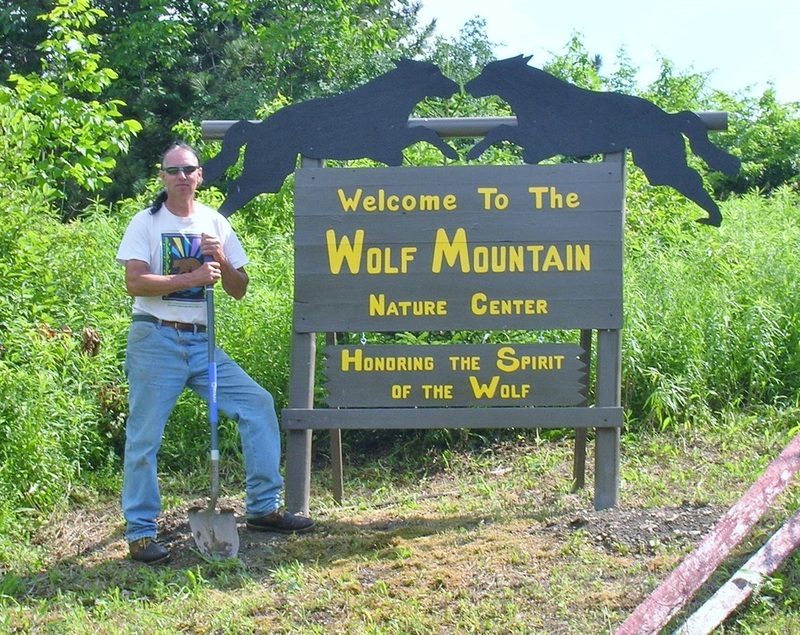 .2 miles turn left onto Beaver Meadow Rd and follow signs to Wolf Mountain (2.6 miles). Hopkins Crandall Rd is a left turn and driveway is on left about .1 mile. From Binghamton/Norwich/Oneonta: Rt 12 north to Rt 23 west. Go 5.6 miles to Rt 16. Turn right onto Rt 16, go 2.8 miles. Turn right onto Hopkins Crandall Rd--we are 2.2 miles on the right. We are an outdoor nature center with an indoor (heated by woodstove in winter) classroom and gift shop. All of our power at the classroom, gift shop, and our log cabin home is generated 100% by solar and wind. Our paths around the animal enclosures are grassy, fairly level terrain. There are some short, gravel walkways leading to the classroom/gift shop area as well as a wheelchair accessible ramp. Benches are located periodically around the center's grounds for visitors to rest or to sit and enjoy watching the animals. We are a smoke-free facility! Absolutely no smoking anywhere on center property! Please NO PETS! While we absolutely love animals, pets are not permitted on center grounds under any circumstances--this includes in your car! Even if your pet makes no noise, our wolves will smell them and become extremely agitated. We are a sanctuary and are committed to providing our animals with a stress-free environment. Anyone bringing pets will be asked to park at the bottom of our driveway and walk up the hill to the center. Thank you for your understanding and compliance.